Nowadays, Full stack developers are considered the jack of all trades of the tech world. They are the ones who have specific knowledge of each & every layer of software development. They are proficient in working with both front-end and back-end technologies and can become a prototype into a fully-functioning product. Besides, desired by employers everywhere, full-stack developers own a variety of both front-end & back-end skills. If you are pondering why full-stack developers in such selective demand, it’s because most web developers are extremely talented. In addition, the pay for a full stack developer is extremely competitive. Be it in tech giants (like Google, Amazon, and Facebook) or IT companies (like Accenture, Infosys, and Wipro); they are perceived to occupy the top spots in the lists of best organizations to work for. In this article, we will be presenting the most essential skills required to become a Full-Stack developer today. Let’s start with what is a full stack developer accurately. A full stack developer is a developer who specialized in both front-end and back-end web development. With the knowledge of what it means to build applications from start to end, a full stack developer can plan, manage, and develop software with general know-how. Besides, they can handle all the work of databases, servers, systems engineering, and clients. Depending on the project, what customers need may be a mobile stack, a Web stack, or a native application stack. The main difference among front-end and back-end developers is that front-end developers handle creating the user interface features of a website, while back-end developers work with internal tasks such as applications, databases, and web servers. Accordingly, combined they are accountable for building the technology and coding that makes a website function properly. Both skillsets are essential for being a talented web developer and will give you a support when applying for jobs. If you are the person who learning new concepts and technologies frequently, this is a surpassing career path for you. What are the Personal Traits of Full Stack Developers? If you feel better with this list and your confidence grows even stronger, it’s time to discuss the technical side of the issue. 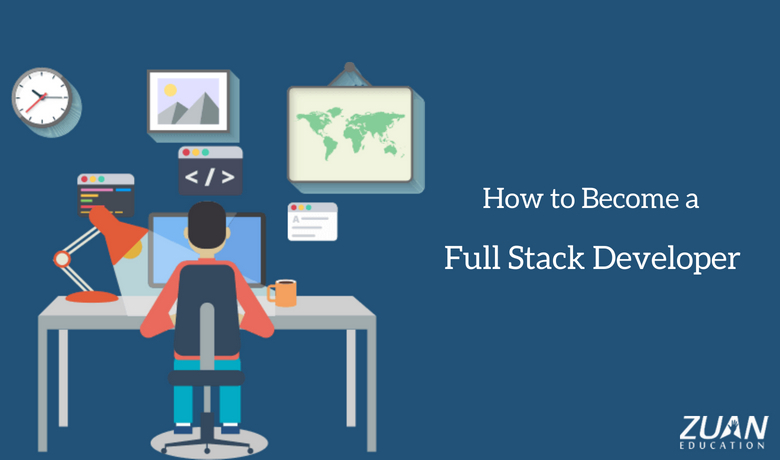 Let’s look deep down on how to become a full stack developer and how can you land up at your favorite job. HTML/CSS – Hypertext markup language (HTML) and Cascade style sheets (CSS) are a backbone of any web development language and it is mandatory to grasp a sound understanding of both of them if you are willing to become a full-stack developer. Nearly every single program, whether online or in-person, that is guiding you on how to be a web developer and it will start with HTML and CSS because they are the building blocks of the web. Angular – Angular is a full-fledged MVC framework created by Google. Most of the firms were manipulating the Angular 1.x version. Google frequently updated angular js, and the current version is Angular 4 after the release of Angular 2. You must be proficient in numerous programming languages, like C #, JAVA, PHP, Python, Perl, Ruby, etc. As most of your core business processes require to be written in these languages. But you also need to master the language grammar, and to be quite familiar with how to structure, design, implementation, and testing. For instance, if you choose JAVA, then you want to master the object-oriented design and development, design patterns, J2EE-based elements of the development and more. Databases are also essential because you will need a place where you can store all the data and access it for future use. Being a full stack developer, you also require to have at least one or two databases and understand how to interact with the database. Some of the topics you need to learn to gain full stack development skills are relational databases (MySQL), NoSQL databases (MongoDB, Redis), Oracle, SQL server, graph databases (Neo4j), and other web stores. You should always learn about the architecture of web programs. If you want to create a more complex web application, you should know how to structure your code and data in order, how to separate your files, how to structure the data in your database, where to perform certain computational tasks, where to store your large media files, and much more. Some topics to remain in mind: AWS, Heroku, performance optimization for applications, and model-view-controller (MVC). Good DevOps leads to heightened efficiency, leading to a solid product. The knowledge of DevOps tools is important because with automation becoming a crucial part of every company’s success, a full-stack developer must be familiar with some of the DevOps tools as well. It also improves collaboration between software developers and IT teams so the work progresses faster and smoother. Git is the popular version control system that enables developers working on a team to keep track of all the modifications being made to a codebase. Knowing Git and how it works will be useful for you in your coding and software development work. You should clearly learn the concept behind Git and work around with it yourself. It’s important to know a few important things compared to Git so that you learn how to properly get the latest code that you have missed, update parts of the code, make fixes, and change other people’s code without breaking things. This is necessary especially if you require to be working a lot with software development teams. When you become a full stack developer, it is quite important you learn how to store a specific data and how to implement a particular task in the most efficient and logical way possible. This topic is somewhat polarizing in the software development world because there are developers who don’t think there should be such a massive focus on computer science topics like tree traversal, algorithm analysis, sorting, matrix manipulation, etc. This one’s a bit difficult since many believe that learning computer science is not required to be a great full stack developer. Why Pursue a Career in Full Stack Development? Do you need to have many career options wherever you go? Or maybe you are just the type of person that loves dynamic change and learning new things regularly. That makes full-stack development the career for you. The Full-stack developers continually need to update their skill set and technical know-how, meaning you want to learn new stuff all the time. That actually benefits you out in the long run: you will be more important on any team with the knowledge that’s cutting-edge. Because of the wide range of skills needed to be a full stack web developer, there are some candidates applying for positions, leaving more opportunity for adequate candidates. The job outlook for web developers is expected to grow 13% by 2026, which is faster than the average rate for all occupations. According to he indeed survey, the average pay for a full stack developer is ₹ 6,31,892 per annum in India. Where to Learn Full Stack Development? Are you a novice in web development? Do you want an experienced mentor in a classroom-based full stack development training to upskill your career? You can learn full stack development from Zuan Education and it will be the best place for you to learn basic to advanced level. Here you will learn in-demand full stack developer skills from an expert trainer and grow your knowledge with live project sessions. So in a nutshell, the full stack developer is by no means to accomplished overnight. What you need to do is laying the technical foundation, strengthen the core skills, and keep learning for more challenges. I hope you have found this article useful. Do share your thoughts below in the comments section now! Very very nice article! I hope it will help me out in my career. Thanks for sharing this nice information. Hi. I have not seen these such fruitful content providing blogs.